"Facing the Screen Dilemma: Young Children, Technology, and Early Childhood Education"
20-page guide written to help early childhood educators make informed decisions about whether, why, how and when to use screen technologies with young children. 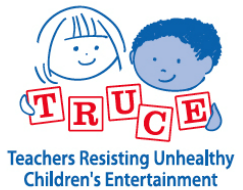 It is a joint project of TRUCE, the Campaign for a Commercial Free Childhood and the Alliance for Childhood. "Media & Young Children Action Guide"
​TV, DVDs, computers, video games and other electronic media are a powerful force in children's lives. Shows, advertisements and the toys and other products linked to the media influence most aspects of children's development, learning and behavior.